The right people. The right solutions. We plan, design and implement applications of different architectures. We analyse applications in heterogeneous environments and develop interfaces, protocols and optimizations based on well-established technologies. Our team has considerable experience in finance and banking and a profound knowledge of mathematics, physics and statistics. We plan, design and implement web applications based on Java technology and modern frameworks. Based on PostgreSQL we develop specialised fast and scaling database extensions. We plan, install and administer the IT infrastructure of your company. Our developer team brings considerable knowledge, skills and experience into your projects. This enables us to use the proper tools with respect to our clients needs and the coverage of a broad list of requirements within a large project. Our main focus in software engineering is not only on functionality and usability but also on performance and scalability. The latter is often tackled by employing more powerful hardware, a measure which does not lead to an effective cost reduction on the long run. Our aim is simply to achieve this cost reduction for our clients. Other important aspects are: short development cycles, simple migration paths, adherence to budget and schedules and close cooperation with our clients. 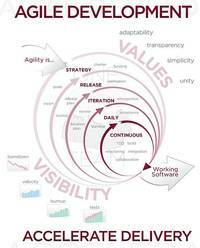 Not least because of these aspects we prefer agile methods. Experience of our developers in OOA, OOD and OOP enables us to provide efficient solutions for complex problems. Quality control, regular testing and refactoring are intrinsic parts of our development process. By employing open source technologies wherever it is possible and useful we increase the transparency and maintainability of our software solutions even more. In fields determined by mathematics and statistics - for example market and credit risk calculation - we gained profound experience in integration of tools like R and Matlab with our solutions. Last but not least we offer planning, installation and administration of the IT server infrastructure (network/mail/web on Unix) of our clients. Large projects are often complex and partly risky undertakings and may prove to be mission critical. They are determined by their targets and constraints, for example budget limitations, schedules, resources and others. Those targets and constraints are to be clearly identified and agreed upon by the project managers and the client. On the other hand it is a well known fact that modern software projects are often too complex as to be thoroughly planned from the beginning. Our trained project managers accomodate to that fact by enforcing scrum, prototyping, test driven development and iterative and agile methods. Thereby they not only contribute their skills and experiences to each phase of the project but also support the customer from a bird's-eye perspective in oder to provide the overall survey at any given time.